Do you want to be able to serve your customers across distances? Maintain full service even in the evening, at night, and low season? Expand into new markets for a fraction of normal start-up costs? Then FrontPoint™ is the solution for you. The FrontPoint Pod™ (Personal Online Desk) enables you to meet your customers where your customers are. 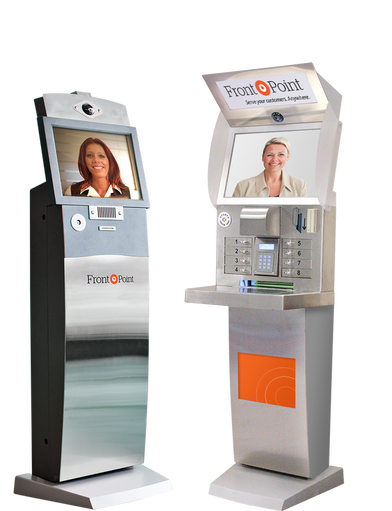 Through FrontPoint Pods™ you can serve your customers – for example issuing keys and tickets, documents, card payments, access control, and remote, real-time communication from your ordinary customer services or reception. FrontPoint™ gives your customers a totally new experience in service, with a personal, human feel. Forget unhygienic touchscreens and analog maps, and let your customers receive personal service through a FrontPoint Pod™.